Eventually, all carpets look a little tired and old and are in desperate need of replacement. However, before you rush out and end up spending a lot of money on something brand new, money can be saved by calling in some professional cleaners. The resulting deep clean can be quite astonishing, giving your carpets an entirely new lease of life. To get the best results from a deep clean, you’ll need to vacuum and shampoo your carpets. Cleaning occurs in several steps. First, carpets are vacuumed to remove any large and easily removed items. Then, industrial machines spray shampoo and hot water into the pile. The cleaning head then works its way into the carpet, agitating the fibres to loosen the dirt, before sucking up both the grime and liquid. After the initial sweep, it’s a good idea to clean the carpets again; this time without using any shampoo. This third step acts as a rinsing stage, drawing the remaining dust and dirt from the fibres whilst ensuring no shampoo’s been left behind. Though professional carpet cleaning isn’t very expensive, if you’re working with a small budget, it’s easy enough to do yourself. The process doesn’t require any particular skill, nor is it difficult; it’s just time consuming, especially if you’ve got a large home. Many stores across the UK, including Homebase and HSS, hire out cleaning machines for between £20 and £28 per 24 hours. With carpet shampoo only costing about £15, you could clean the entire house for only £35…just be prepared to put in the hours! 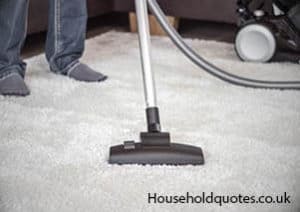 It doesn’t cost much to have a carpet professionally cleaned, and though you might want to clean a couple of rooms, when it comes to the entire house, it’s a lot of work. In this instance, it’s worthwhile getting some quotes to have the work done for you. Certainly, by the time you’ve hired a machine, bought shampoo and spent a lot of your personal time cleaning, it almost makes sense to pay a little more to hire someone whilst you put your feet up. When you’re booking professional cleaners, there are a few important points to remember if you want to avoid unexpected costs. For most companies, it’s not worthwhile cleaning a single room. As such, there’s often a minimum charge applied which averages out at around £50. It’s much better and cheaper overall to get your whole house cleaned in one go than to hire cleaners for one or two rooms at a time. You may find that stubborn stains require a lot more work to remove and, therefore, cost a little more. When you’re gathering quotes, be sure to mention particular stains (red wine or paint, for example) that might be hard to get out. Carpet cleaning firms will not be expecting to remove furniture from a room. If they turn up and are unable to start because a room needs clearing, they’re likely to charge more. In some cases, they won’t move the furniture at all and will either clean around it or will ask you to move it. Before booking anyone, be sure to ask about this requirement. Overall, the cost of carpet cleaning is minimal, and for a standard three-bedroom house you can expect to pay around £200 if you have two reception rooms, three bedrooms and the hallway, landing and stairs cleaned. This will be a little more in a four-bed house, depending on the size and number of additional rooms. For the best prices, negotiate for a quote to cover the cost of cleaning your entire house instead of each room, giving you the cheapest way to a luxuriously sparkling new interior.